The Natural State has a progressive tax rate which is based on taxpayers’ income levels. This means the more you earn, the more you pay in taxes. Tax brackets are the same whether you are filing separately or jointly. Arkansas residents have to pay taxes just like all U.S. residents. For federal income taxes and FICA taxes, employers withhold these from each of your paychecks. That money goes to the IRS, who then puts it toward your annual income taxes, Medicare and Social Security. The information on your W-4 is what your employer uses to know much to withhold for federal taxes. That’s why you need to fill out a W-4 whenever you start a new job. You can also update your W-4 if your filing status changes (for example, if you get married) or if you otherwise just want to change the allowances you’re claiming. Note that in early 2018 the federal income tax rates changed because President Trump signed a new tax plan into law. The new rates mean that your paycheck tax calculations changed slightly. There aren’t any more big changes planned for 2019 but it’s a good idea to check your W-4 at the start of the year to ensure all information is still correct. One factor that affects how much federal tax is withheld from your paycheck is your marital status. Different tax brackets apply depending on your filing status and so your paycheck will also change with your filing status. If you have dependents, you might qualify for more withholding allowances, which means less will get taken out in taxes. Other factors affecting the size of your paycheck include the frequency of your pay periods and what deductions you’ve authorized your employer to make. For example, your employer will deduct money from each of your paychecks if you make contributions to retirement plans, such as a 401(k), or different health plans, such as a health savings account. Arkansas’ state income tax rates do not change based of your marital status. Instead the state’s system is based on an individual’s income level. There are seven tax brackets with rates ranging from 0.9% on your first $4,399 up to a rate of 6.9% on income above $77,401. If you’re a resident of Texarkana, Arkansas, you can claim the border city exemption. This means that any income you earn in Texarkana, if you’re a resident there, is exempt from Arkansas income tax. If you have a job outside this area, you will be subject to state taxes. If you’re thinking about becoming a resident of the Natural State, or if you are considering refinancing a mortgage, take a look at our Arkansas mortgage guide for information on rates and details pertaining to each county. 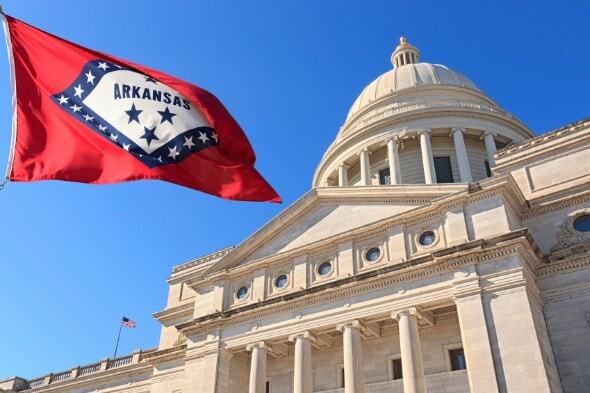 Arkansas residents can tweak their paychecks in a few ways. If you received a big refund check last tax season or if you owed a lot of money, check your W-4. You can likely claim more or fewer allowances. This will change the size of your paychecks so that you’re closer to paying only what you actually owe in income tax. Play around with different scenarios in the paycheck calculator to see how a certain number of allowances will change your take-home pay. Another way to change your paychecks is to ask your employer to withhold a certain amount from each paycheck. All you need to do is to fill in the appropriate line on your W-4. You’ll get this money back come tax season; you might choose to do this if you know you tend to owe a lot when you file your taxes. Making or adjusting your pre- and post-tax contributions is yet another way to alter your paycheck. Depending on your budget and priorities, adding more money to different options such as a Health Savings Account or a commuter benefits program can help save you on some taxes. Other pre-tax deductions such as a 401(k) decrease your taxable income, which can lower what you owe Uncle Sam.